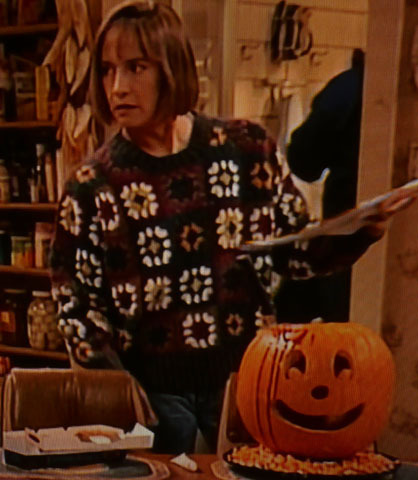 In case you weren’t frightened enough this Halloween, check out this absolutely terrifying granny square sweater/wardrobe travesty from an episode of Roseanne! 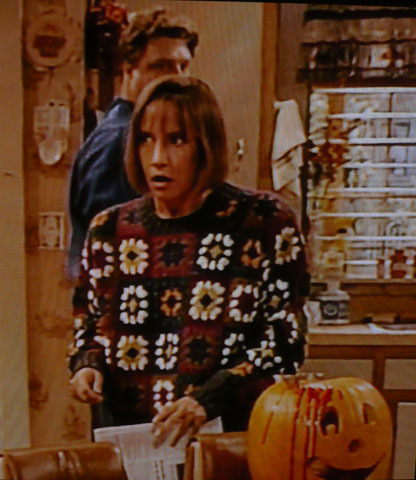 Even Laurie Metcalf herself looks totally petrified by this horrifying fashion disaster. If only everyone could just be as creative with their costumes. This entry was posted on October 31, 2013 by croshame. It was filed under Movie Still Monday . Ok, this is one bad looking sweater, but it’s the environment and the people in these pictures that scare me the most!